Los Angeles Times editor-in-chief Davan Maharaj is the subject of a scathing new report alleging that his "ego, insecurity, and warped priorities" were responsible for dragging down morale and causing a staff exodus. The report, by Ed Leibowitz of Los Angeles Magazine, claims that Maharaj had "a grim determination to tighten his grip on power," leading him to denigrate employees behind their backs and sit on potentially explosive stories for months without explanation. While meeting with top investigative reporters to discuss an investigative series on the drug Oxycontin and its maker, Maharaj allegedly asked the team "to take a few moments to admire the Ferragamo shoes he was wearing." At another meeting, he "spent more than half an hour on his phone, trying to redeem airline miles for a trip he was planning to take." Much of Leibowitz's article deals with that investigative series on Oxycontin, which Leibowitz reports Maharaj inexplicably stalled for some time. One of the lead reporters on that series, Scott Glover, is now employed by CNN. Glover declined to comment. Leibowitz says he spoke to more than 40 former and current staffers for his report, as well as top editors Marc Duvoisin and Larry Ingrassia, who pushed back against criticisms of the editor-in-chief. Both Maharaj and a Times spokesperson declined to provide additional comment to CNNMoney, but Maharaj gave a brief statement to Los Angeles Magazine. "We are in very challenging times in the newspaper business. My job is to make sure we produce quality journalism for our readers. Yes, that means I have to make difficult decisions. Running a newspaper isn't a popularity contest. We and I should be judged by the quality of our work, and by that standard the Los Angeles Times has done very well in the past five years. Our journalism speaks for itself, and it speaks loudly." CNNMoney spoke to several current and former Los Angeles Times sources at various levels of the organization, and all of them said that the broad thrust of Leibowitz's article was accurate. 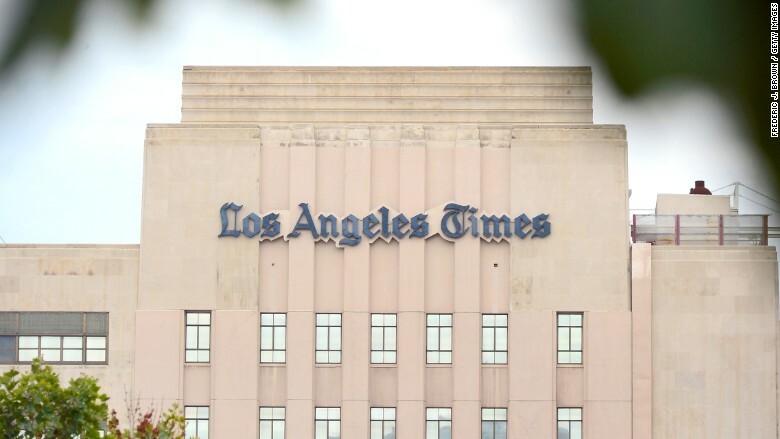 The Los Angeles Times has been beset by a litany of challenges in recent decades that go beyond the struggles facing the newspaper industry generally. Among them: Owner Sam Zell, who famously drove the paper and its parent company into bankruptcy; the subsequent years of buyouts and layoffs; and finally the new ownership, which has pledged to revitalize the Times into a "global entertainment brand" but has done little to follow through. The L.A. Times has also failed to gain prominence in the digital space. While the paper is the fifth largest-staffed paper in the country, it commands a fraction of the online audience that its competitors do. Leibowitz cites Alexa Internet statistics ranking The New York Times and Washington Post websites as the 21st and 41st most popular web sites in the country, while latimes.com is in the 139th spot, "26 rungs below drudgereport.com." But the assertion that the Times' own editor-in-chief is part of the problem is a new revelation, at least to the public, and one that has potential to radically alter Maharaj's legacy at the paper's helm.